• Charlie sells around 12 cases of hamburgers weekly. Each case contains 80 hamburgers. Each hamburger patty costs $.60. The price per patty quoted by the new vendor is attractive, but is this a good deal for the restaurant? Beyond the cost savings, what other factors need to be considered before buying a lot more hamburgers than you have sold in the past? How can Joe make this deal more attractive to Charlie? 1. How many hamburgers does Charlie normally sell during the period of the contract? 2. What is the total cost of the hamburger inventory for the period? 3. How many hamburgers will Charlie need to purchase under the new vendor contract? 4. What is the total cost of this inventory? 6. What is the percent savings per hamburger under the new deal? 7. What is the cost savings in total, if Charlie accepts the new vendor deal rather than buying the same amount of hamburgers at his current vendor price? 8. 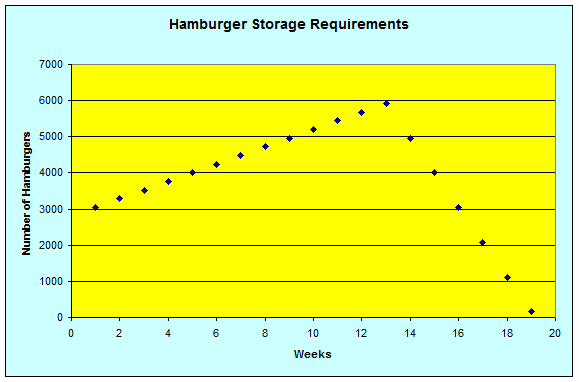 If hamburger sales remain stable at 12 cases per week during this period, how many hamburgers will Charlie have remaining in inventory at the end of 13 weeks? 11. Beyond the price per patty savings, what factors should Joe consider when advising Charlie whether or not to take the new deal? The 13 week contract period is too short. 13 weeks does not take into account all the time Charlie needs to sell the excess inventory the new vendor wants Charlie to buy. It will take Charlie slightly over 19 weeks (more than 6 weeks after the contract period ends) to sell everything he is being asked to purchase. It will take Charlie slightly more than 6 weeks (after the contract period ends) to sell everything he is being asked to purchase. To get the discount, is Charlie required to pay the entire contract cost up front? Can he make weekly payments? To get the discount, is Charlie required to take delivery of all 230 cases at once? If Charlie must take full delivery at once, does Charlie have the freezer space necessary to store an inventory of 18,400 hamburger patties? If Charlie only needs to take delivery of the first 50 cases initially, and then another 15 cases per week for 12 weeks, this reduces the storage requirements considerably. Under these circumstances, the maximum number of patties he must store is only 5,920, which occurs at the end of the 13th week. (keep in mind that Charles sells 960 patties per week) This is shown on the following graph. All figures are shown as of the end of each week (not the beginning), “after” Charlie has sold 960 hamburgers for that week. To find out what the storage requirements would be at the beginning of the week, just add 960 to each of the data points. Assuming that Charlie has the enough cash on hand to pay the vendor ($7,680), how much money will Charlie lose by paying the new vendor the entire amount, rather than putting the money in a savings account of some sort? Charlie needs to test the new hamburger patties on his customers before he places a large order. Since the new vendor is offering a greatly reduced price, it is likely that the quality of the hamburger patties is also reduced. Is the new meat a low quality substitute for the $.60 patties that Charlie is currently using? Is there more fat? Will the new taste drive customers away? If the new meat does not taste good, Charlie must continue to sell it for 19 weeks or throw it away. Safe Storage requirement. What is taste of the meat after it has been kept in the freezer for several weeks? 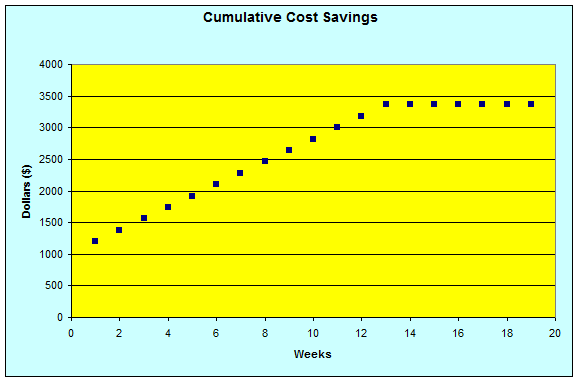 How much will insurance costs increase with more inventory on hand. Offer to store the excess inventory at no charge and deliver only what Charlie needs each week. Allow Charlie to pay for only what he has actually received.